This is a game that immediately conjures up many magical memories and moments of Euroleague action. This is because this is going to be the 30th time these sides meet in Euroleague duty, with the Catalan club holding a major advantage at the moment. Barcelona hold a 19-10 record in these clashes, although the difference looks to be the 9-0 run of wins that Barcelona enjoyed between April 2013 and October 2015. In a twist of fate, Xavi Pascual, the current coach of Panathinaikos was on the Barcelona bench during that run of form. The hosts are slightly better off at the moment, holding a 10-8 record for the season while the away side comes to Greece with an 8-10 record. However, it was the Catalan club that grabbed the win when these sides met earlier in the season, picking up a 72-57 win in Catalonia, with that score line being the lowest score for Panathinaikos so far over the season. Barcelona knows that they are trailing but a win on Tuesday night gives them the head to head record and narrows the gap between the sides to one game, so there is all to play for in this game. Mike James is the main man for the Greeks at the moment, providing an average of 13.7 points per game while Nick Calathes has offered an average of 12.5 points per game and an average of 6.2 assists. KC Rivers has also offered an average of 11.9 points per game. For the Catalan side, Tyrese Rice is the main man, leading in points, with an average of 14.8 points per game while also providing an average of 5.3 assists per game. There was an impressive debut last week for Vitor Faverani, who grabbed 18 points and 8 rebounds. This could be a close game and Barcelona may finally be showing signs of coming to life this season. 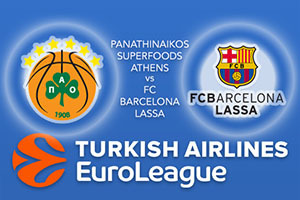 Take FC Barcelona Lassa at +4 at odds of 1.90. For the Over/Under market for this game, look at going OVER 148.5 at odds of 1.90. Bet Now!